HomeSuper LeagueHow will Wigan Warriors look next season? How will Wigan Warriors look next season? With Wigan seemingly departure after departure including that of current head coach Shaun Wane in recent months, the club is going to look entirely different at this stage next season. Whether the changes prove to be positive or take some getting used to only time will tell. However, replacements will most certainly be needed after the number of players leaving the club both during and at the end of this season. So far the Warriors have only made four new signings in comparison to the six, possibly soon seven, key players that have left. Both the long serving Michael McIlorum and ‘the man of the people’ Anthony Gelling left in January this year just before the start of the season. McIlorum joined Catalans and continued to play in Super League whereas Gelling returned to the NRL and had a stint with New Zealand Warriors before signing a contract with Widnes Vikings for 2019. Midway through the season the long speculation around the departure of Sam Tomkins was announced, with it being revealed he too would be joining Catalans at the end of the season. The information about Tomkins leaving was announced in May, but shortly after the fullback’s future was announced Wigan then revealed that they had signed 2015 Man of Steel Zak Hardaker as a replacement. Hardaker can begin his four-year contract on November 8th when his UK Anti-Doping ban has ended. May proved to be a hard month for the Wigan fans as another player announced he was leaving but the Warriors were not just losing players, but coach Wane too. The successors to Wane have now been found with the announcement that former players Adrian Lam and Shaun Edwards will take over. Lam will be in charge next season as interim coach with Edwards to take over as head coach from 2020. The other player departure in May was confirmed to be 23-year old forward Ryan Sutton who is set to move to Canberra Raiders in Australia next season. Sutton’s contract with Wigan expires at the end of the season and he has signed a two-year contract with the NRL side. Just half way through the season and Wigan had already lost some important characters, but the exits continued. 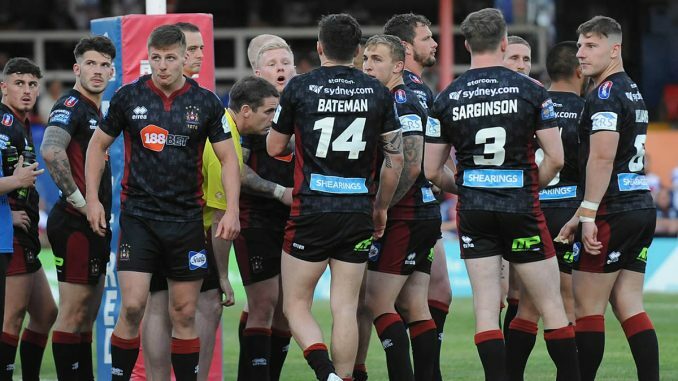 The only Tomkins brother left at the club was the next to leave, both the Warriors and Joel Tomkins came to a mutual decision about his exit from the club after some off-field antics. The eldest Tomkins brother then joined Hull KR in June after leaving Wigan. Alongside the news about Sutton joining Canberra Raiders there were also rumours linking John Bateman with the same NRL club. As the season progressed the rumours seemed to die down however, this month it has been confirmed that Bateman will leave the Warriors at the end of this season. The only aspect that will give the fans some contentment is that unlike previous departures, the 24-year old has agreed a three-year deal to return as Wigan’s marquee signing after his time in the NRL. Six players will leave the club in total, but this could yet increase to seven before the season is over as rumours continue to circulate over the future of George Williams. It is said that a number of NRL clubs are interested in signing Williams, with the young stand-off expressing his interest in moving to an Australian club if given the opportunity. So what could last years Challenge Cup finalists look like as the Super 8s begin this time next season? Although the new head coach’s have been confirmed the Warriors will undoubtedly need to add to their recruitment so far which has seen Zak Hardaker, Joe Greenwood, Chris Hankinson and Joe Bullock all brought in.